Prunus cerasifera ‘Pissardii’ is a small, ornamental plum tree with rich, dark-purple leaves displayed on blackish stems, against which the pink buds and blush/white flowers that appear in spring are a beautiful contrast. The flowers are followed by plum like inedible fruits in the autumn, so extending the period of interest. With a rounded habit, the eventual height and spread of this Purple Leaved Plum tree after 20 years is about 5metres tall and 4 metres wide..
Prunus cerasifera ‘Pissardii’ does well in any reasonably fertile soil, in sun or partial shade and tolerates cold exposed locations but it’s best to avoid very wet conditions. It requires no pruning to form a good shape making it a great specimen tree. 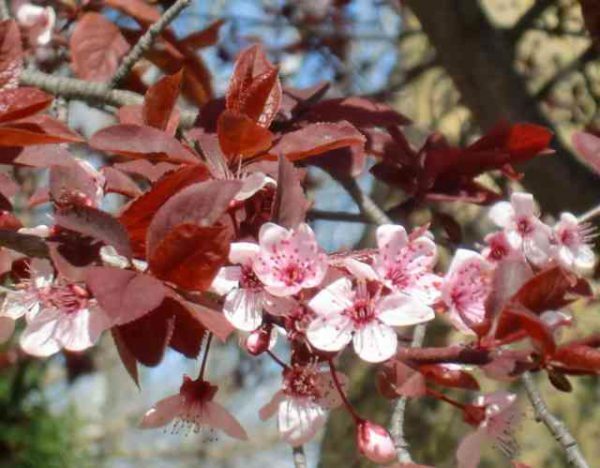 Tags: Prunus cersaifera, Prunus Pisaardii, purple plum, semi-mature tree.